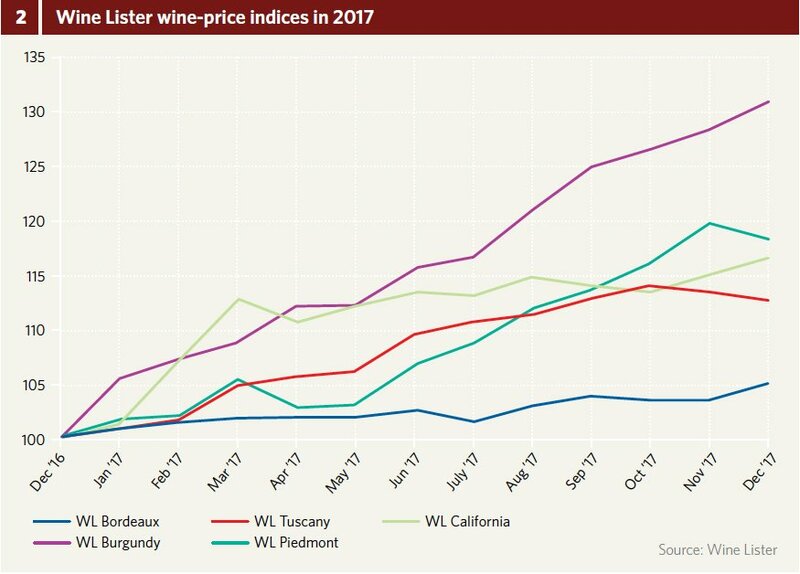 The fine-wine market continued to appear strong in 2017, with prices buoyant thanks to the continually weak pound but gains less marked than in 2016. The Liv-ex 100 rose 5 percent over the course of 2017. After dipping in April for the first time in 16 months, it then climbed haltingly, with further dips in September and December. The Liv-ex 1000 gained 10 percent during the course of the year (fig.1). 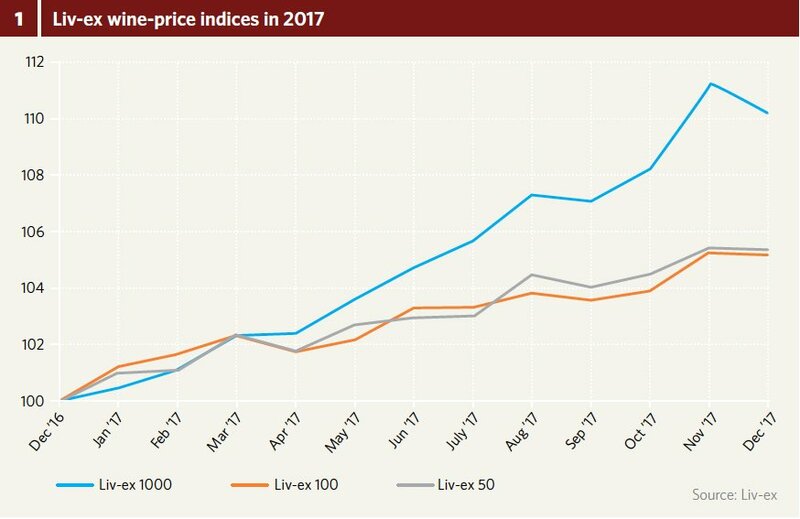 This broad index—comprising more wines from outside Bordeaux and also Bordeaux wines with lower price points—reached an all-time high, whereas the Liv-ex 100 remains 15 percent down on its apex in summer 2011. Looking at region-specific indices from Wine Lister (fig.2), we see that Burgundy was the strongest fine-wine region in 2017. Its five top brands gained 31 percent in price over the course of the year, compared to just 5 percent for Bordeaux’s. Ranging from 12 to 18 percent gains, the top five brands from Tuscany, California, and Piedmont also saw solid growth. As for 2018 prospects, the trade is circumspect, with a series of unknowns on its hands. A large part of the year’s success for the fine-wine trade rests on the three Bs: Bordeaux, Burgundy, and Barolo. The 2016 Burgundy en primeur campaign has been and gone, and while successful, there was very little wine to sell. Barolo 2014 will be “complicated,” according to George Wilmoth, head of sales at Justerini & Brooks, though he notes that of course “good wines can be made in challenging vintages.” Bordeaux will be the region that might “carry the wine trade through 2018,” says Wilmoth, if its 2017 en primeur campaign is a success. For the complete version of Liquid Assets, please refer to Issue 59 of the print magazine.